Captain Daniel Ronzieres was not overtly distrustful; he was merely obeying company rules as the boxes, containing thousands of silver bars, were stowed neatly and securely in his cabin. Along with the bullion, over 36,000 silver coins in similar boxes joined the hoard. As each chest was being checked against the manifest the rest of the less valuable cargo was being loaded into the holds of the Dutch East India Company (VOC) ship Rooswijk. The Dutch port of Texel had been busy with other VOC ships, although the three-year-old Rooswijk was deemed to be the largest. Most of the cargo that was being stowed below her decks was mundane. Sheet copper, masonry blocks, cases of sabres and other weapons were being taken to establish and maintain the forces and buildings in the Dutch East Indies Company headquarters at Batavia, South East Asia. In that year of 1740 it seemed that the eastern continent had no need for European goods. However, their spices, porcelain and silks were in demand and fetched excellent prices. It was because of these circumstances that the VOC ships had to carry vast amounts of specie, with which to purchase their produce. 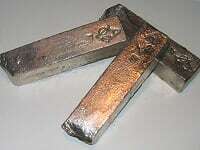 The ingots of silver were originally mined from Spanish-held Mexico and then sold to the Dutch to be melted down into four pound bars with the Amsterdam VOC stamp upon each one. The ingots would have been converted in Batavia - now Jakarta - into Javanese currency with the rest shipped off to Siam (Thailand) and Bengal to be made into their local coinage. Inside some of the bonded boxes were thousands of silver eight reales, along with roughly cut and stamped cobs. These coins - about the size of a British crown - were known and used throughout the world as 'pieces of eight'. The silver content, which was also mined and minted in Spanish Mexico, contained a regular 26.5 grams of .903 fine silver. As the hatches on Rooswijk's cargo holds were covered with canvas and secured with rope, Captain Ronzieres' thoughts were with the voyage ahead. They were not of the fear from pirates or privateers as the ship carried a formidable amount of cannon and a crew of 250 men, which included soldiers, but of the adverse weather. It was the beginning of January and a bitterly cold north-east wind had set in. As they set sail on the 8th the wind increased to gale-force. The relatively calm confines of Texel were soon behind them as the off-shore wind rapidly reached storm force. All that day and night they fought against the elements. When darkness fell the following night, further vision was obliterated by a blizzard. Daniel Ronzieres' men found working the pitching and rolling 850 ton ship extreme and hazardous. They were continually making sail changes to the vessel as she tacked back and forth making for the open sea and away from the shallow Dutch shoals. While the night wore on conditions became worse and navigation impossible. In the thick weather Ronzieres had lost his bearings as the ship was being driven further westward by the wind. He calculated that he could not beat up against it and reduced his sails to a minimum. The captain had no idea what part of the English Channel they were in; however, the constant sounding of the lead showed that he had plenty of water under the keel. He also considered that it was too deep for the ship to anchor and wait for the storm to abate. Most of the soldiers were being sick and trying to hold on to anything that was secure in their restricted quarters. Freezing condition permeated throughout the vessel and all the cooking fires had been extinguished soon after they had left port. Those below decks were becoming hyperthermic and, with sea-sickness, were losing the will to live. The seamen were too busy to succumb to this malady and merely cursed the weather - although the least courageous of them were starting to realise the desperate state that their ship was in. Apart from her billowing sails the rest of the Rooswijk was covered in snow, building up in small drifts on the windward side of her bulwarks. Footprints on the deck from the crew were soon covered, as the ship careered along with the storm. As the vessel ran up on to the Goodwin Sands the crew and troops felt the ship jolt to a halt and then start to slew uncontrollably, beam on to the heavy seas. Immediately, tumultuous waves overwhelmed her and giant seas crashed down upon the deck, sweeping away any persons that were still standing. The masts were wrenched out of the steps in her keelson, splintering and ripping up the deck. Within minutes the heavily laden Dutch East Indiaman was gripped by the sand and started to break up, as the massive seas pulverized her to pieces. The deaths of the entire crew and troops were almost instantaneous. They were drowned in the freezing conditions and their screams for salvation went unheeded. Morning arrived with the storm still blowing. Deal boatmen, unable to launch their boats in the heavy surf, wandered the beach in search of any scraps that the onshore wind had blown in. It was soon evident to the men that there had been a shipwreck in the night. However, the pieces of washed up timbers were so smashed up that they could not identify the unfortunate vessel. When one man came upon a chest, surging about in the surf, he eagerly risked becoming drenched as he snatched it from the waves. On being opened, a look of disappointment clouded his face. In the casket were vast amounts of waterlogged letters written in a foreign hand. When the honest fellow handed the mail in to the authorities, the name of the ill-fated ship was then discovered. The loss, to the Dutch company, was a great one, financially, as well as in human terms. In the year 2002, Ken Welling, an Essex builder, had worked out an area on the Goodwin Sands where the wreck of the Rooswijk might have been. This was achieved after many hours of research and deduction from English newspapers of the 18th century and Dutch archives. In the years that followed he searched, with the limited amount of equipment he could tow from his 17ft boat, on and around the hostile waters of the Goodwin Sands. His quest would always be fraught with danger; as when he found wreckage protruding from the seabed, he would dive upon it alone. With the shifting sandbanks of the Goodwins he knew there was always going to be a chance that the wreck would never reappear. Eventually, in the summer of 2004, he found what he had been looking for. It started off as just another bottom target on the echo sounder, although his magnetometer showed that there was a vast amount of metal causing the machine to peak. Whilst diving on these new wrecks he was always hopeful; nevertheless, he was used to disappointment. Over the years he had found many old rotting timbers on the seabed which he could eliminate from his search. When he found some cannons amongst the timbers, he was soon to realise that this was a wreck of status. Further exploration showed that there were chests, although worn, still intact. When he prised the top off one of them he saw the glint of silver. At last his vision had been fulfilled. During 1798 the Dutch East India Company (VOC) was taken over by the Dutch Government who, to this day, is still the legal owner of all treasures that were lost from the VOC ships. Ken made contact with a representative and, in total secrecy, they arranged for the bullion to be recovered. Through the dive season of 2005, from July until late August, the 209 ton salvage vessel Terrschelling appeared on the sky line off Deal. The Terrschelling was skippered by Nigel J Boston, who, along with his team of professional divers, was very skilled in the art of recovering old and valuable relics - in the past the vessel had spent numerous periods on the wreck-site of the Mary Rose. Also aboard was the eminent underwater archaeologist Alex Hildred and it was she who oversaw and catalogued over a thousand artefacts. 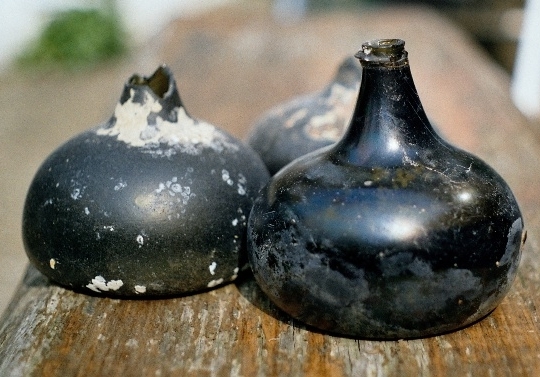 Amongst these objects were the personal items of the crew; from the officers mess deck, pewter plates, glass wine goblets and a pewter mustard pot with a spoon still in it. A huge copper cauldron from the galley and fifty muskets from the Master at Arms' cabin were rescued. For Alex, all these artefacts were making a social statement from the 18th century. Although the vessel could be seen from Deal and Ramsgate there was, apart from a few inquisitive fishermen, little interest in her goings on. It was certainly unknown, to the majority, that she was salving a vast fortune of silver, which had lain on the Goodwins for 265 years. Four months later some of the treasure was handed over to Holland's government finance minister, Joop Wijn. He accepted it, along with many artefacts destined for Dutch museums, aboard the Dutch Royal Navy frigate De Ruyter, at Plymouth in a ceremony of entente cordiale. Because of the tragedy in 1740 the silver bullion never reached its destination. However, it was not completely lost when the Goodwins released its centuries old secret location - thanks to the determination and dedication of diver, Ken Welling. 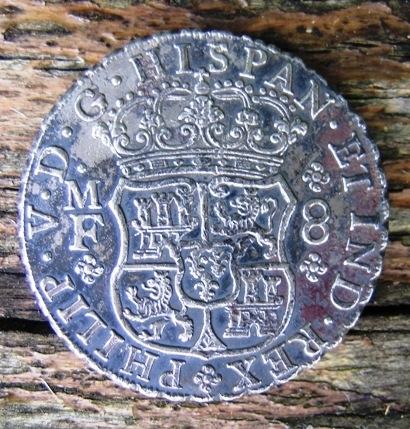 The Real de a Ocho, also known as the Spanish dollar, the Eight Royals Coin, or the Piece of Eight (Spanish Peso de Ocho), is a silver coin, of approximately 38 mm diameter, worth eight Spanish reales, that was minted in the Spanish Empire after 1598. Footnote: More stories of ancient shipwrecks on the Goodwin Sands can be found in David Chamberlain's book "Lost And Found" available from local bookshops (at £3.99) and online from eBay and Amazon. This site is designated under the Protection of Wrecks Act 1973 as it is or may prove to be the site of a vessel lying wrecked on or in the sea bed and, on account of the historical, archaeological or artistic importance of the vessel, or of any objects contained or formerly contained in it which may be lying on the sea bed in or near the wreck, it ought to be protected from unauthorised interference. Protected wreck sites are designated by Statutory Instrument. The following information has been extracted from the relevant Statutory Instrument. The remains of a Dutch East Indiaman which foundered towards the north-eastern end of the Kellet Gut, after grounding on the Goodwin Sands, in 1739. At the time of loss she was bound from Amsterdam and the Texel to Jakarta with coin, bullion and a general cargo, including sheet copper, sabre blades and stone blocks, as well as passengers. The Rooswijk is a vessel of the Dutch East Company (VOC) built in 1737 which stranded on the Goodwin Sands in 1739 while en route from the Texel to the East Indies. The vessel is described as a 'retourschip', a specific type of Dutch East Indiaman which was designed to withstand the lengthy voyages of 18 months to three years typically undertaken en route to Batavia (Indonesia). The site was found after several years of documentary research and following a magnetometer survey of the site. Designation Order: No 61, 2007 Made: 13th January 2007 Laid before Parliament: 17th January 2007 Coming into force: 9th February 2007 Protected area: 150 metres within 51 16.443 N 001 34.537 E. No part of the restricted area lies above the high-water mark of ordinary spring tides. Built in 1737 in Amsterdam for the Amsterdam Chamber of the Dutch East India Company, the Rooswijk was lost on the Goodwin Sands one day out from the Texel on her second voyage to the Indies in January 1739. Her previous voyage had been to Batavia (Jakarta). The day following her departure from the Texel, the Rooswijk is recorded as being wrecked with all hands and troops. "A great many pieces of wreck and packets of letters, all directed to Batavia, have been taken up." Many pieces of wreckage were found floating in the Downs. There were numerous newspaper reports on her loss, including the London Written Letter: "We had this morning an account from Deal of a Dutch East India Ship outward bound, being ashore on the Goodwin Sands; and this afternoon it was reported to be lost, and all her crew." Contemporary newspapers record "the violent storm of wind, etc. which has held for two days past, has done considerable damage to shipping lying in the River (Thames) …"
It therefore appears from sources that the vessel was caught up initially in an easterly storm which afflicted the eastern coast of England from north to south. This would have driven her directly onto the Goodwin Sands on her outward-bound passage from Amsterdam, and the "contrary winds" mentioned in some sources would have caused her to shift on the sands. In turn this would have contributed to the ship breaking up rapidly, consistent with the wreckage and mail being all the clues left to her loss, together with the total loss of life. Doubtless, however, the severe cold also contributed to the total loss of the crew. Prior to 1752, the New Year fell on 25th March. The date of loss therefore probably occurred circa 30 December 1739. A sport diver found the remains of the Rooswijk after extensive documentary research and magnetometer survey. The discovery was kept secret to enable the recovery of bullion. In December 2005, silver found aboard the wreck was handed over to the Netherlands Finance Minister, representing the Dutch Government as heirs to the Dutch East India Company, having taken the company over in 1798. Dutch archaeologists expressed regret that they had not been part of the salvage operation. The seabed consists of fine-grained, mobile sand with broken shell. Some small patches of stones were observed in areas of scouring around upstanding wreck material. Small sand waves have been recorded in all areas searched, separated by small hollows. The salvage of the Rooswijk prior to designation is believed to have recovered more than 1,000 artefacts including a musket stock; 2 musket side plates marked "VOC"; a musket trigger plate; two wooden chests and lids; 21 ebony knife handles; 2 concreted knives; a Mexican pillar dollar; 553 silver ingots marked "VOC"; a tobacco tin; a huntsman's sword hilt; a gilt sword hilt; a sword scabbard belt hook; part of a leather scabbard; a brass wine pot with a missing leg; a pistol stock; a cutlass handle; a cutlass scabbard; a copper alloy cauldron; and 3 stoneware vessels. The floor timbers collapsed following the wreck and the contents of each deck fell on top of each other, reflecting the physical and social layers of shipboard life. The top layer therefore included items from the officers' dining room, including pewter dinner plates and a mustard pot, wine glasses, a copper cauldron, brass candlesticks and a box of eye glasses. 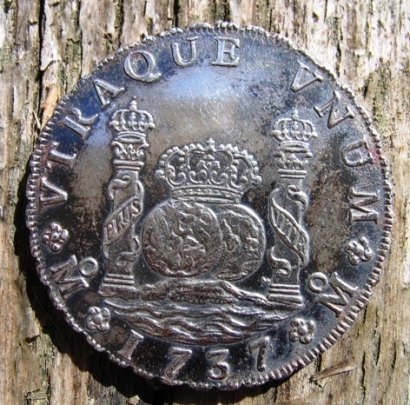 The silver bullion was also found in this area in 4 lb bars, having been mined in Mexico, and sold on to the Amsterdam Chamber of the VOC, whose imprint is on the bars of silver, for use in the coinage of Batavia. The layer immediately underneath comprised the contents of the ship constable's cabin. As he was responsible for the maintenance of law and order on board, 50 muskets were found in the area. Beneath this again was the vessel's 'cartridge locker' containing bar and round shot, while three cannon and a gun port were located in an area thought to represent part of the gun deck. A pair of Frechen mugs, dated 1550 - 1600, was located within the site and represented an anomaly, possibly indicating that there is wreckage from more than one vessel on this site, although it could be that, owing to their robust nature and widespread use, they were still in use on a vessel such as the Rooswijk in 1739. The Maritime Museum in Vlissingen will house objects recovered from this wreck and handed over to the Dutch. Maritime archaeologists are at the Goodwin Sands diving, excavating and recording the wreck site of an 18th century ship. And details of their finds can be learned at an open day tomorrow. To book a place email education@nauticalarchaeologysociety.org or telephone 023 9281 8419. The international team is working on the Dutch merchant ship Rooswijk, which sank in the area in 1740. The ship was heading for Batavia (modern-day Jakarta in Indonesia) with a large cargo of silver ingots and coins. It is now a protected wreck site and the ships' remains are owned by the Dutch government. The site is managed by Historic England. The current #Rooswijk1740 project is led and financed by the Cultural Heritage Agency of the Netherlands, part of the Dutch Ministry of Education, Culture and Science. "Wrecks such as the Rooswijk are time capsules that offer a unique glimpse into the past and tell a story. Sharing that story with a wide audience is a key part of this project and we look forward to the fascinating insights and discoveries that the Rooswijk excavation will uncover this summer." "The Goodwin Sands has been a treacherous place for ships throughout the centuries and is now a treasure trove for archaeologists. The rapidly shifting sands mean that the site is even more exposed now than it was during our initial dives to assess the condition of the Rooswijk last year. This makes the excavation urgent." There are a total of 250 DEIC shipwrecks, only of which a third have been located. Never before has a DEIC wreck been scientifically researched or excavated on this scale. Material recovered from the wreck site is being taken ashore to a warehouse in Ramsgate for preservation and recording. The finds will be returned to the Netherlands and in future some material may be made available for display in Ramsgate. There will be two open days in Ramsgate with two sessions each, 10am and 2pm, tomorrow and on Saturday, 16th September. Visitors will be able to see the finds and explore the techniques and technology the archaeologists are using. Crew members of a ship which sank off the Kent coast more than 275 years ago have been identified. Researchers used archive documents to name 19 of the 237 shipmen who were on board the Dutch ship the Rooswijk. Among them were a senior surgeon, a 19-year-old on his first voyage and a sailor who had previously survived a shipwreck. The vessel, which was carrying coins and silver ingots, sank on Goodwin Sands in January 1740. 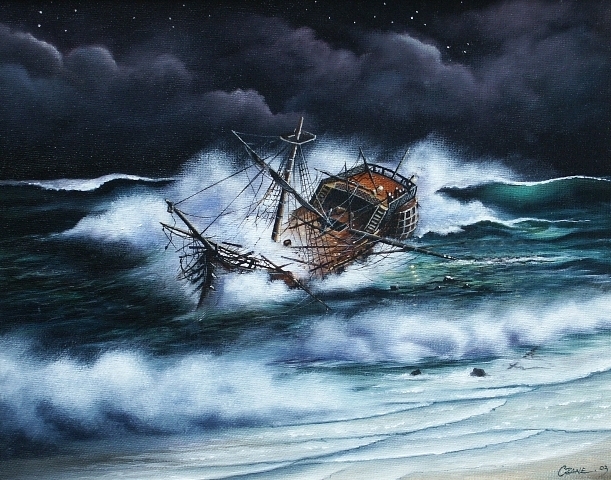 More than a thousand vessels are known to have been wrecked on the notorious sandbanks, dubbed "the great ship swallower". Meanwhile, coins have been recovered from the shipwreck that were not part of the sanctioned cargo. 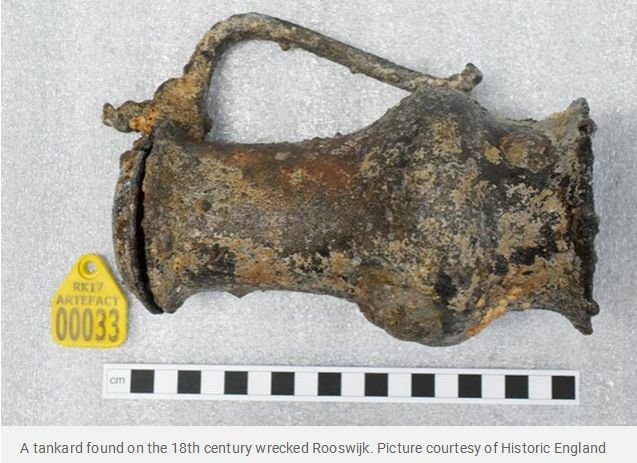 Archaeologists say this suggests some of the Rooswijk's passengers were carrying silver to trade illegally. Some coins had holes deliberately made in them - an indication the crew sewed them into their clothes to smuggle to the Dutch East Indies. Maritime archaeologists have made an astonishing discovery off the Kent coast in England. While investigating an almost three-hundred-year-old shipwreck they found some coins that had been sewn into clothing. This is the second important maritime archaeological find in Kent, recently. A Tudor ship was also found on some mudflats in Tankerton Beach some weeks ago. The latest discovery is one that is exciting experts and offering an insight into the lives of ordinary people in the 18th century, demonstrating the rich maritime heritage of Kent. The find was made near the wreck of the Rooswijk on the bed of the English Channel. Both the crew and the ship descended to the bottom of the sea off the coast of Kent, sinking after striking a notorious sandbank, Goodwin Sands, that the BBC reports it is known as 'the great ship swallower'. 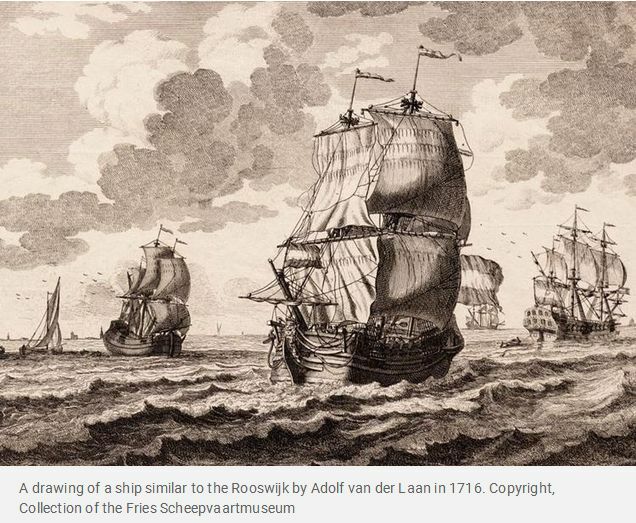 The Rooswijk sank in the winter of 1740 and all its 237 passengers and crew were lost. The ship's cargo of silver bullion, iron, and cut stones, that was destined for the East Indies, was also lost. 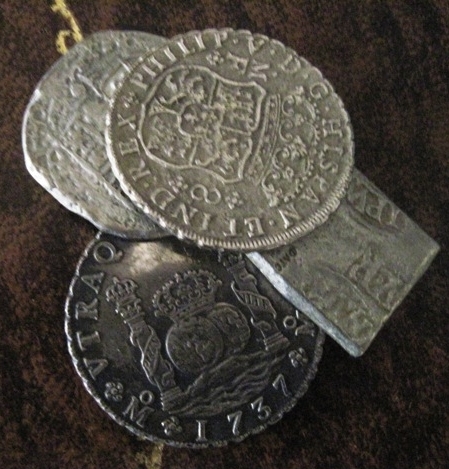 Maritime archaeologists, members of the Rooswijk1740 project, discovered a haul of silver coins some 85 feet down on the seabed. Many of the silver coins had holes drilled so that they could be sewn into clothing. There were not only Dutch coins but also ducats from the Spanish Netherlands. But why were they secreted in clothing in this manner ? The answer would seem to be that these monies would have been prohibited from being taken to the Dutch Indies. The Rooswijki1740 project is a partnership between Historic England and the Netherland's Cultural Agency. 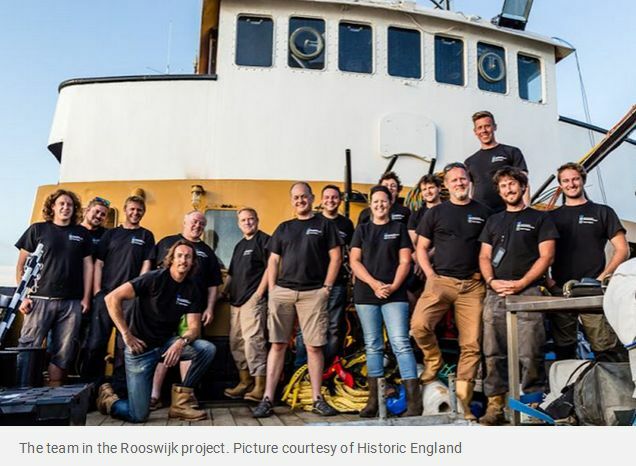 According to the Daily Mail, the leader of the project, Dr. Martijn Manders has said that, "The Rooswijk is special because it tells us about ordinary people of that time". The find also helps experts to understand the personal experiences of those who were lost at sea on a January night, almost three centuries ago. The team from the project have been working on the site since last summer. According to the Daily Mail, "the team is working towards the stern of the ship" and expect more finds. Items and materials recovered from the wreck are being stored at a warehouse in Kent, where they will be preserved and recorded. It is expected that some of the most interesting items will eventually be put on public display in the Netherlands.